Eat Bolo - We Can't Wait For Them to Open in Los Angeles! These Donuts are THE Best Donuts on the West Coast! With 375,000 Filipinos living in Los Angeles, making it the largest Filipino community outside of the Philippines, FAHMLA strives to create a strong sense of solidarity and leadership within the neighborhood. "The best way to understand a cultural community is through their food. Not only does EAT. PLAY. MOVE. aim to gain awareness for the Filipino community, and show Filipino Americans that there is a strong support system of mentors that share the same roots, but it also represents how the culture has merged with the people of Los Angeles and its community of foodies to bring all of Los Angeles a little bit closer to the Filipino culture via the love of food." says Rayson Esquejo, co-founder of FAHMLA and owner of Rayson Media. "This event isn't Filipino specific! There are brands here who love the culture and just want to integrate it and appreciate the flavors of the community." Ube Bae Ice Cream Sando - Picture Perfect! Among the many vendors who infused signature Filipino flavors into their items there are a few that stuck out in particular. Eat Bolo, a new restaurant opening early 2018 in Los Angeles, showcased their ice cream sando's! Guests were able to pick between the Ube Bae Ice Cream Sando, (ube ice cream with milk drizzle, unicorn sprinkles, and a butter toasted bolo,) or a Pina Buko Ice Cream Sando, (coconut ice cream with pineapple jam, coconut, and butter toasted bolo.) "We have paired together with other concepts in Chinatown and we try to bring some of the flavors from HongKong to the US," explains Joey Ngoy of Eat Bolo. "People can expect unique ice cream flavors with crispy toppings. We will also have other items on our signature menu. For now, people can check us out at Smorgasburg LA." Both packing a serious punch! The bun was similar to a nice brioche bun toasted to perfection and the smooth ice cream (similar to a creamy gelato) was mind blowing. Both perfect for the summer heat and instagram worthy. Needless to say, we can not wait until Bolo opens its latest location! Paella Paella Served Three Delicious Dishes. THIS is the Pork Paella - Worth the Wait! Paella Paella kept the crowd engaged as they made various forms of their delicious paella. Mid East Tacos were a huge hit! 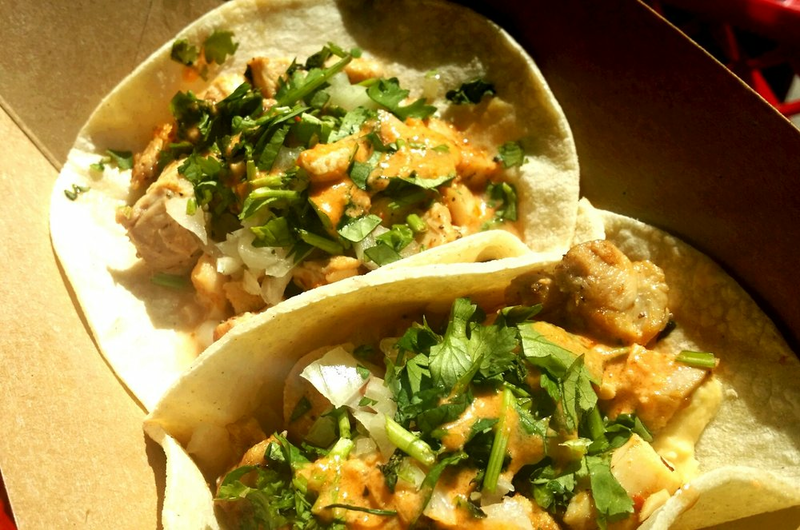 The establishment prides itself of merging Korean inspired flavors with tacos and burritos. The final result - undeniable. "We are gonna sell out by 2 o'clock," explained Chef Maverick of Mid East Tacos. "Guests have been lining up nonstop. The food being pushed out is straight fire and the mixture of ingredients mesh nicely." The display was beautiful in itself. The burritos and tacos were packed to the brim with well-marinated meat, rice, and a specialty sauce to top it off. Yummy Chicken Tacos From Mid East Tacos! The event had 20 vendors on site showcasing traditional and innovative fare as well, musical performances, and fitness activations. Food vendors such as: Ninong's, Hopia Like It, Grill City, Johnny Pacific LA, Eat Bolo, Kindness and Mischief, Rice and Shine, Kitchen 1726, DK's Donuts, Cakies Love, Ensaymada Project,Helado's Pops, Bsweet, Paella Paella, Baked Desserts, Benadditz, Mini Kabob, Baon Truck, Spoon & Pork, Manini Grindz, White Rabbit, and Thai Mexican Cocina were on site showcasing their latest innovations.